Installing a jet kit in your carb is the best way to get the maximum performance and longest life out of your bike. The stock carburetor from the factory is designed to meet Import Regulations ... not peak performance. Once you install or modify an exhaust or intake, you have put your bike into a leaner condition that will eventually destroy your engine due to heat from running lean. If you notice any popping, you are extremely lean. Our jet kit provides the parts and installation instructions to enrich all the circuits in the carb, to fix this problem, and add performance you can feel in the seat. 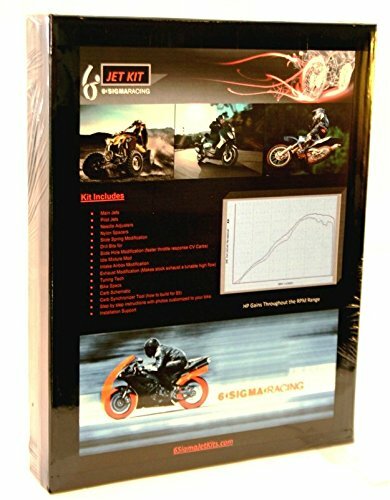 This is a comprehensive jet kit, addressing all throttle positions, throttle response, and each kit is custom made to your bike and its modifications. Replacing just the jets does not address 1/4-3/4 throttle position, or throttle response, only full throttle. 1 KIT IS FOR THE ENTIRE BIKE, ALL CARBS ON THE BIKE. Benefits: More Peak Horse Power - (Designed to gain 6%-8% in HP with intake/exhaust, 2-3% on bone stock.) Longer Engine Life- (The jet kit is a performance upgrade that allows the engine to run cooler which increases engine component life.) 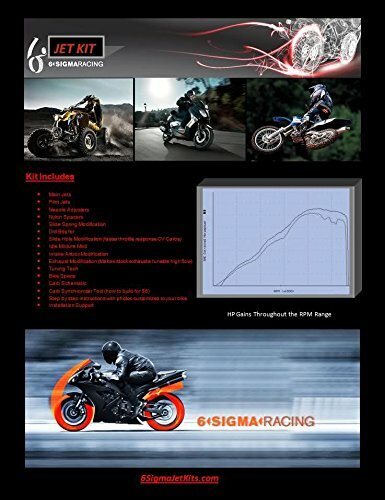 Increased Performance- (Designed to improve all RPM ranges of performance and throttle response.) Lower EGT's (exhaust gas temperatures) If you have installed an aftermarket, or modified the stock exhaust or intake, this is needed or you will damage your engine. Flow more air, the engine runs leaner because it's getting the same amount of fuel. Running lean causes detonation and hotter EGT's which ruin exhaust valves and destroy engines. Kit Includes: Main Jets, Needle Adjusters, Nylon Spacers, Drill Bits for: Slide Hole Mod, Slide Spring Mod, Idle Mixture Mod, Bike Specs, Carb Schematic, Carb Synchronizer Tool (how to build for $5), Step by step instructions customized to your bike. Increased Performance at all RPM's, Faster Throttle Response, & Stops Lean Exhaust Popping that Damages Engines. Each Jet Kit is Custom Made to your Specifications for Optimum Performance, When You Order, Please Email us at 6SigmaJetKits@gmail.com , with Your Exact Year, Model, Modifications Made, & Elevation, So we can Design, Build, & Ship Your Kit. The kit comes with complete instructions for installation. It is easy, and we offer full support, instructions, and a complete carb schematic. Only basic hand tools are required. Kit Includes: Main Jets, Needle Adjusters, Nylon Spacers, Drill Bits, Slide Hole mod (with CV carb), Idle Mixture mod, Slide Spring Mod (with CV carb), Carb Schematic, Specifications, Carb Sync Tool build, Carb Cleaning Procedure, Proper Tuning Techniques, and step by step instructions with photos. We give a 100% Satisfaction Guarantee. Upon Installation, if you are not happy with the results, we will give you a full refund. If you have any questions about this product by 6 Sigma, contact us by completing and submitting the form below. If you are looking for a specif part number, please include it with your message.